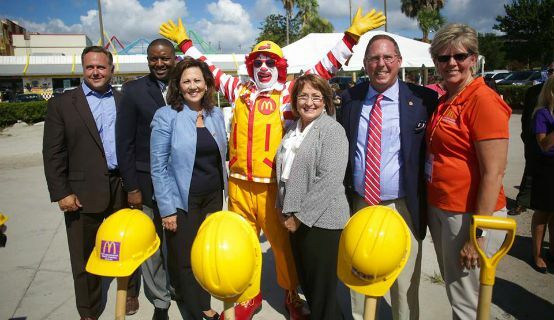 Orange County Mayor Teresa Jacobs joined Karen Garcia, Vice President & General Manager for McDonald’s Corporation-Florida Region and Gregg Oerther, Owner/Operator and CEO of Oerther Foods, Inc., to break ground on the new, state-of-the-art “World’s Largest Entertainment McDonald’s” on Sand Lake Road. The new restaurant will replace the existing iconic McDonald’s that has been serving guests from all over the world since opening in 1976. The new, state of the art building was designed jointly by McDonald’s Corporation and Florida-based architectural and engineering firm CPH, Inc. It will bring nearly 100 construction jobs to the area under the direction of the Venture Construction Company.